1. Extra Small Metal Storage Suitcase £35.00 [x] : I've been obsessed with suitcase storage for as long as I can remember. This metal storage suitcase looks even better piled up with the others from the collection. 2. Quilted Cushion £30.00 [x] : I'm a big believer in adding different textures to a room because it really helps to make a space cosier and more engaging. Plus how lovely is this cushion? 3. 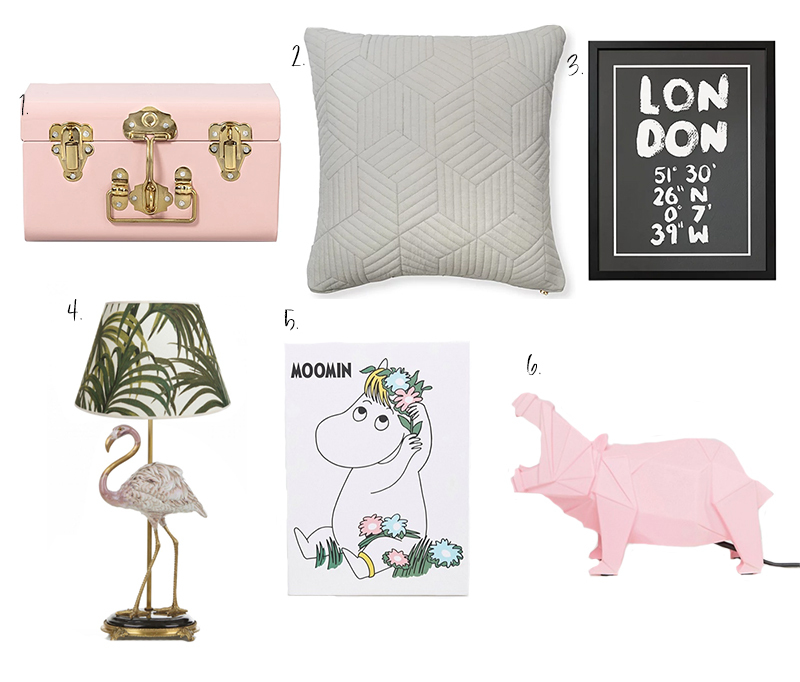 London Coordinates Wall Art £65.00 [x] : At the moment Oliver Bonas's print game is so strong. I really want this London one. 6. Moomins Storage Box £9.99 [x] : I grew up reading Moomin so it definitely has a space in my heart, plus how lovely is this box? 6. House of Disaster Pink Hippo Light £35.00 [x] : Ok a much more affordable lamp and definitely one for those who love something a bit different. Origami style, pink and hippo shaped? Yup, how more unique can you get? That pink suitcase looks so cute! Ah I absolutely love Moomins! I can't be the only one who wants to go to Moominland in Finland one day. The hippo light is really cool - not seen anything like it before.